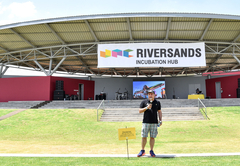 Riversands Incubation Hub, where The Canvas Riversands is based, is a ground breaking project that supports small businesses and entrepreneurs. All conferencing spend is channeled back into the local economy. Whether a board meeting, a large conference, a team building function, launch, concert or market day – we have a variety of spaces to meet your requirements. Our warm and efficient conferencing team will help you create the right canvas for your event needs. 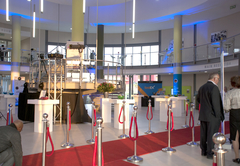 The main auditorium has a seating capacity of 500, plush seating with desks, a dedicated sound room and high quality AV. We have accommodated a 800 delegate conference with live streaming from the main auditorium into other venues on site. 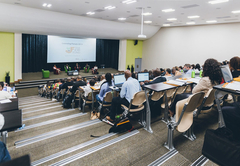 There are two smaller auditoriums which offer cinema-style seating for 98 delegates, with high quality AV and air-conditioning. This is a large conferencing centre with 17 break away rooms with various seating capacities. We can accommodate banquet, school room, U and double U-shaped settings. One of our larger break away rooms offers roller shutter doors and high volume ceilings – perfect for a car launch or machinery display. Our boardrooms are the perfect setting for a quiet meeting or teleconference. 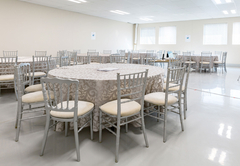 The on-site restaurant with a seating capacity of 180 is also available for hire. This opens up into the outdoor amphitheatre. Wide corridors throughout and a beautiful, spacious high volume atrium makes this an ideal venue for exhibitions. The outdoor amphitheatre has a terraced green space and a professional 3 phase power stage with a capacity for 10,000 delegates. 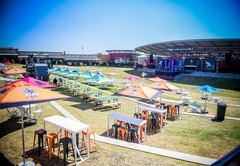 Much of the infrastructure needed for these large events is already in place (stage, toilets, parking and food court area). The space allows for easy set up of access control. Our skilled catering team is able to work with a range of budgets to create delicious conferencing fare. We are able to accommodate Halaal and Kosher guests. Corporate clients will be pleased to know that The Canvas Riversands is a Level 1 BEE Contributor. All catering and event hire spend qualifies for 135% BEE scorecard recognition. We are located in Midrand, just a stone’s throw away from Fourways with easy access to Pretoria, Sandton and Lanseria International Airport. 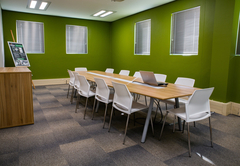 The Canvas Riversands offers a fresh, modern alternative for conferences and events.